PermaSEAL® Plug Washers are used as an alternative to the use of PermaSEAL Rope to form a compression seal when installing PermaSEAL membranes using Brick Plugs. PermaSEAL Plug Sealing Washers are used as an alternative to PermaSEAL Rope to form a compression seal when installing PermaSEAL membranes using PermaSEAL Brick Plug Super or Plaster Plugs. 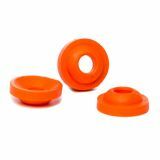 PermaSEAL Plug Sealing Washers allow for quicker installation of PermaSEAL Plugs when compared to using PermaSEAL Rope. We do not suggest that these seals are used on plugs being installed on vaulted ceilings. In this situation we would suggest the use of PermaSEAL Rope.